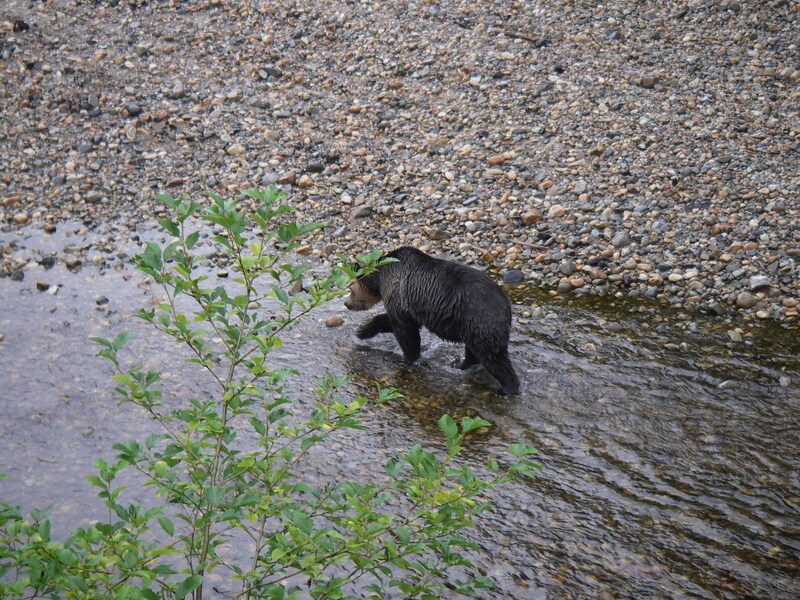 Our guests, from Grizzly Bear Lodge, spend two hours on the viewing stands enjoying their time watching and photographing the grizzly bears on Knight Inlet’s Glendale River. However the bears do spend sometime watching the guests but by in large we are ignored as their prime goal on the river is enough food (calories) to fatten and survive the winter hibernation. This grizzly bear was more interested in the other bears in the area and whether it was safe to proceed into the fishing area we were not part of that decision. Our presence actually makes it safer for mothers and cubs as well as sub-adult grizzly bears as the larger males are a little more cautious near humans. The viewing stands used by Grizzly Bear Lodge are located overlooking the small area the salmon rest in before moving over the weir into the man-made spawning channel. 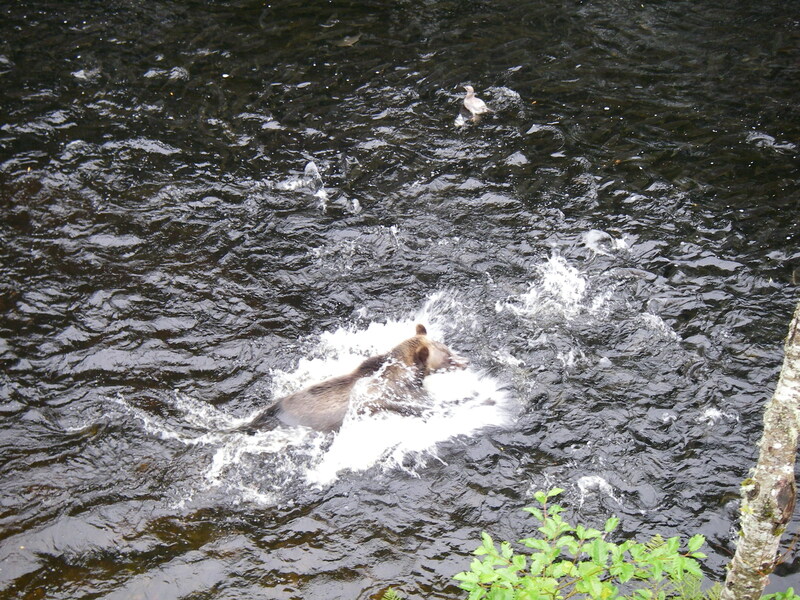 This also makes for an ideal area for grizzly bears to catch the pink salmon that drift down river either having died from exhaustion prior to spawning or having escaped from other grizzlies feeding up stream. 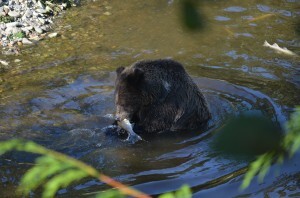 This photo shows a grizzly enjoying its catch as well as three other salmon behind the bear. 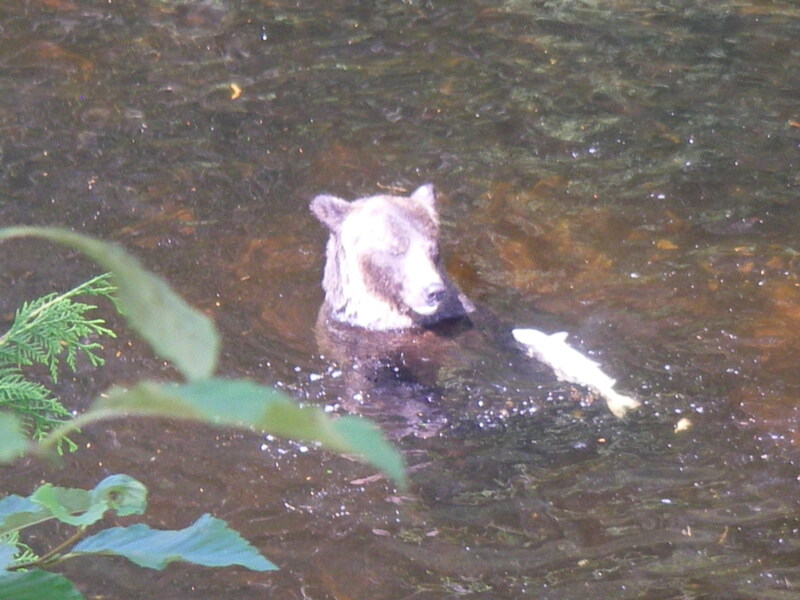 This bear is less that 15 meters (45 feet) from the stand and the photo shows that this is a female pink salmon (males have a large hump on their back and thus the name “humppy”) and the preferred catch for the bears because of the fat rich egg row is contains. 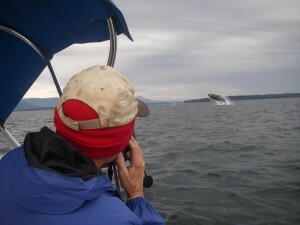 While on our whale watching day we managed to see stellar sealions, harbour seas, eagles and a few dolphins but all these are hard to compare to a humpback whale rising out of the water behind the boat while we are taking a lunch break. The important part of the previous sentence is the word “day”. 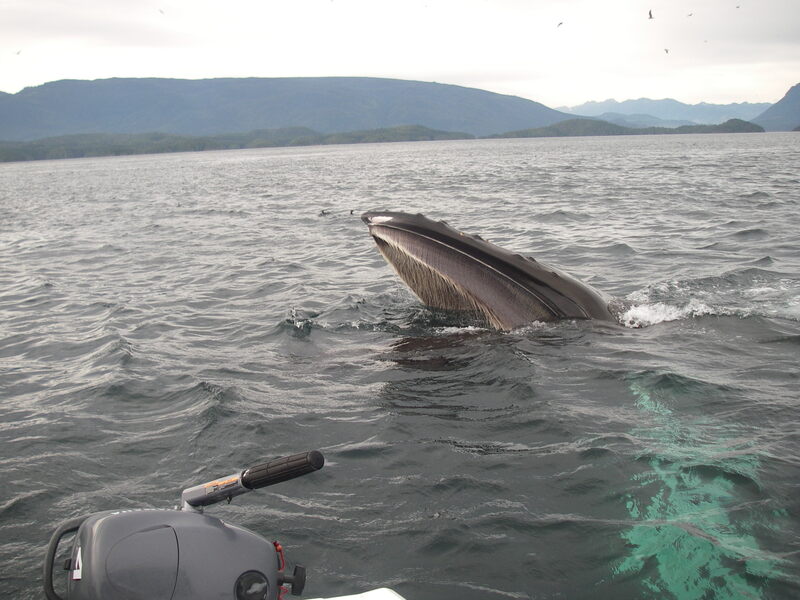 We are not limited to as four-hour tour like the companies from Telegraph Cove or Port McNeil nor do we arrive late in the morning and have to leave early as the companies that travel from a greater distance. We are close to the viewing area, approximately 50 minutes, and unless it is your departure day there is no set time to return to camp so if the activity occurs later in the day we are later returning to the lodge. 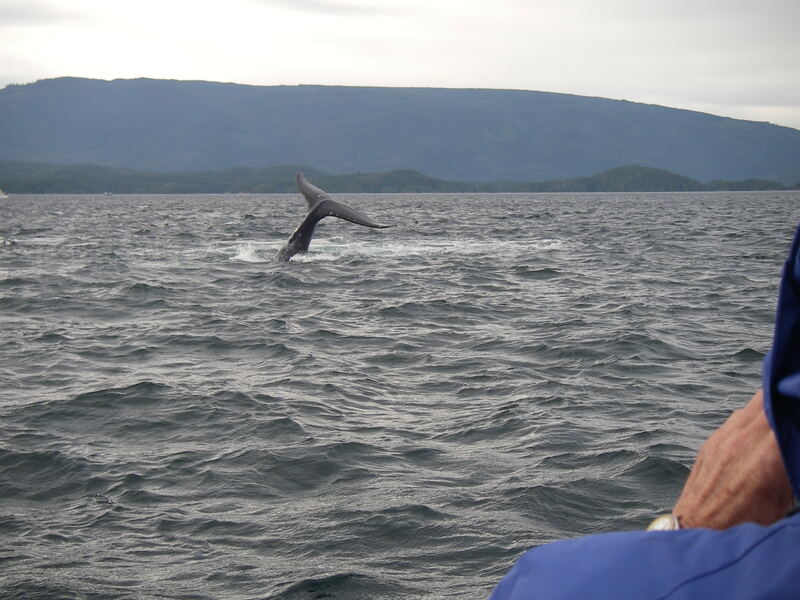 Florence and Ray’s whale watching day was also blessed with a very active humpback calf that spend part of it’s day entertaining us with a number of fluke (tail)) slaps. For some reason it would repeatedly (ten or twelve times in a row) slap the water stop for a few minutes and then repeat the process. 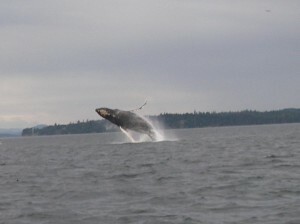 As mentioned in yesterday’s post it was an active day for the humpback whales. 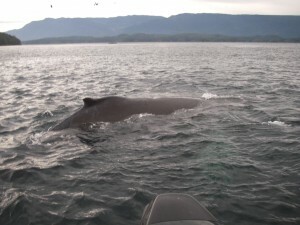 Our lunch break is often in the area of Bold Head where we set up a table in the boat and drift with the tide and the whales. With the motor turned off and no noise but the water lapping against the boat we often have visitors. 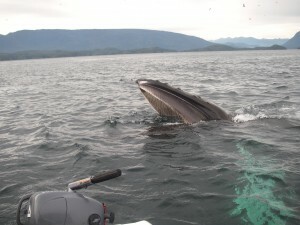 On this whale watching tour we had a humpback whales lunge feed directly behind the boat. 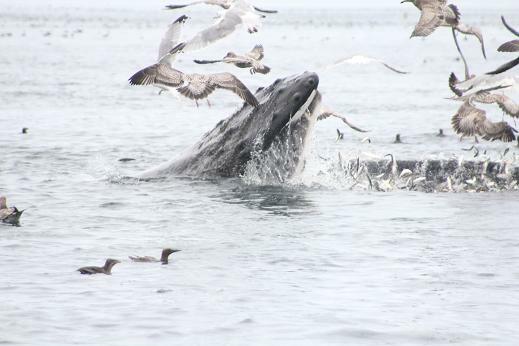 As you can see humpback whales are baleen feeders straining water through their baleen. 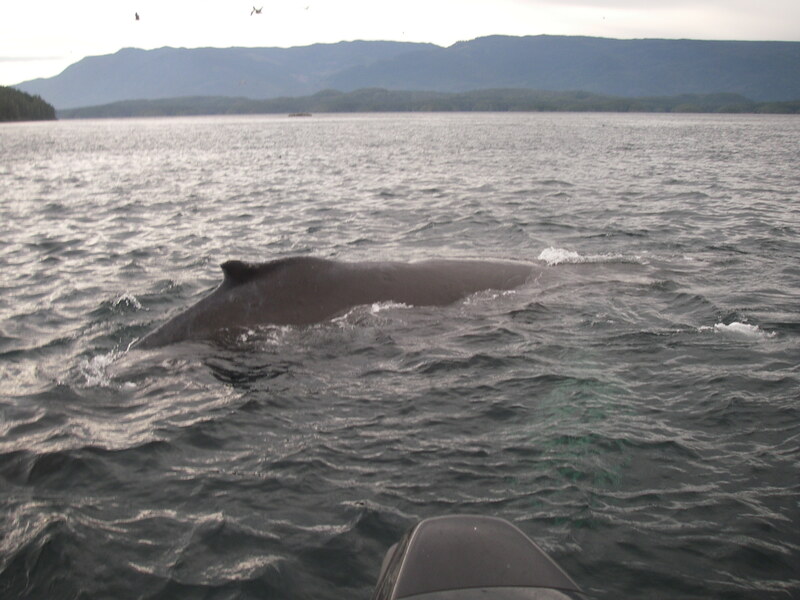 Note also the white of the pectoral fin extending beneath the back of the boat. The whales know our exact position but as our motor is turned off we are not a threat rather like a drifting log. Grizzly Bear Lodges whales watching tours leave the lodge at 7:30 or 8:00, depending on the time of the year, and travel to the area of Johnstone Strait between Vancouver Island and mainland BC. 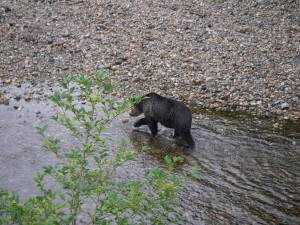 AS on every tour from the lodge we are always looking for black bears on the way to wherever we are going. 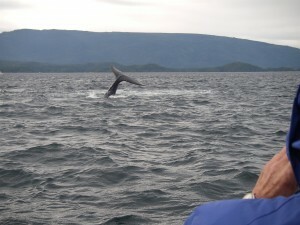 The area off Bold Head was the place to be for humpback whales. 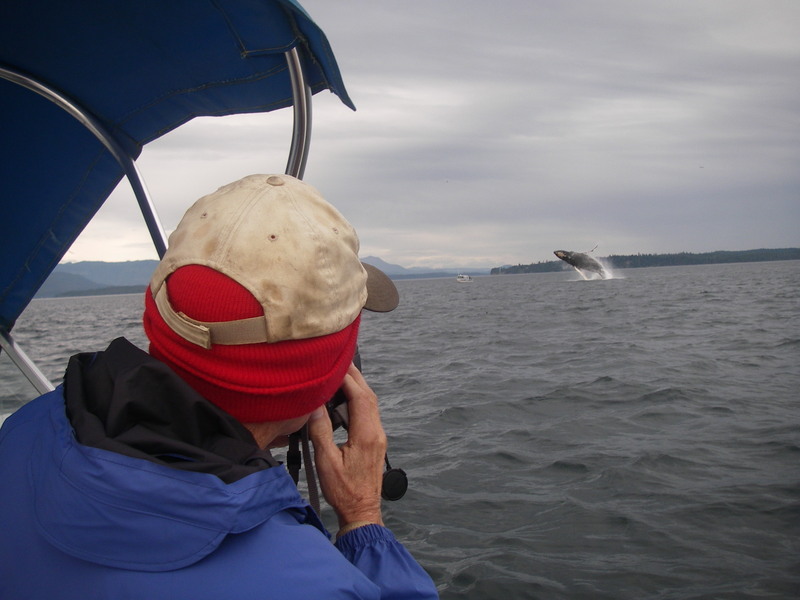 This photo shows Ray with their movie camera getting a great show from a breaching humpback. Normally hard to get a “non movie camera” photo but on this day it was not a problem. The back of the viewing stands has the natural river, which is much shallower than the holding pool and also a travel route to the pool. 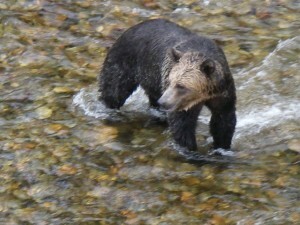 This grizzly bear spent more than half an hour working the river, catching a few salmon before it moved further up the river. If my memory serves me well we saw more than a dozen different grizzly bears on the trip and had good bear viewing all morning. 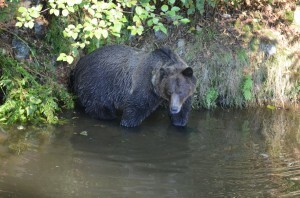 Grizzly Bear Lodge is allotted two hours on the viewing stands between 10:00 and noon each day. 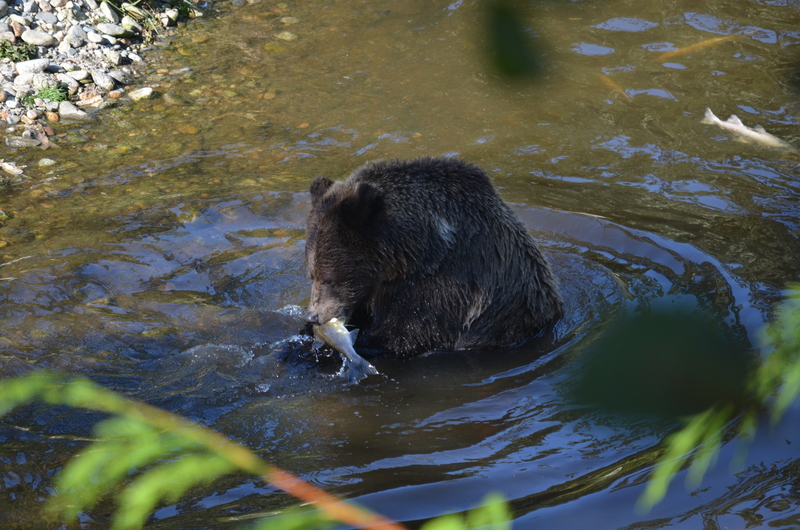 Some grizzly bears are more active and splash around trying to catch salmon, however in the deep water this is often a waste of time. 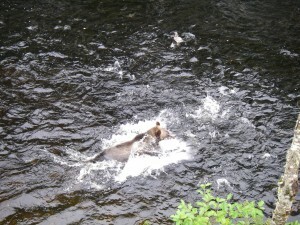 Bears need to pin the salmon against the bottom and them grab them with their mouth and in deep water this becomes a problem making their success rate very low. It is hard to build up the necessary layer of fat if you ate using more calories catching salmon than eating salmon. As I recall we had a good day on the viewing stands, which are, located an hour and fifteen-minute boat ride up Knight Inlet from the lodge. One grizzly spent most of the two hours we have on the stand directly below eating salmon. It did not bother to waste energy fishing rather it sat in the holding pool to the spawning channel and picked up salmon that drifted down stream. 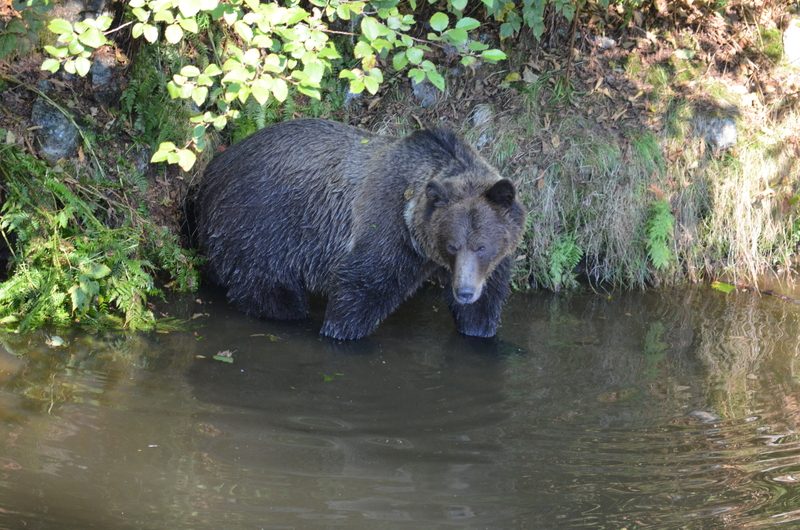 Many grizzly bears fish the spawning channel and wounded and dead salmon drift into the area of the stands making it an ideal area for less energetic bears to fish. 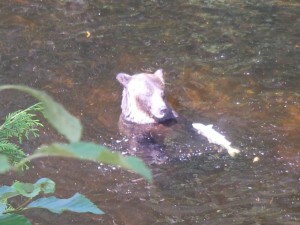 If you look closely this bear is surrounded by pink salmon. Guest first evening in the lodge normally means a local area tour to find black bears. The hour plus boat ride lets guests get comfortable with the boats and guides as well as a chance to see some wildlife such as harbour seals, eagles, black bear and learn a little history of the surrounding area. At certain times of the season the hardest animal to find is the black bear. This is late July and early August when all the berries are ripe and bears are less likely to come to the beach looking for food. This photo is in the spring as the cubs are still quite small. 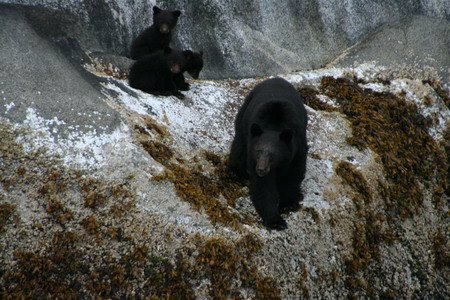 Triplets are not very common for black bears but more so for grizzly bears.